Down That Little Lane is a great online marketplace featuring hundreds of well-curated products and designers. DTLL is also listed in the Bondville Loves online shopping directory, and owner Tessa is an abcd meet-up regular, so this store is close to my heart. This month for our monthly Lucky Door Prize, Tessa is giving a gorgeous Australian homewares gift set of to one lucky Bondville monthly newsletter or daily email subscriber! 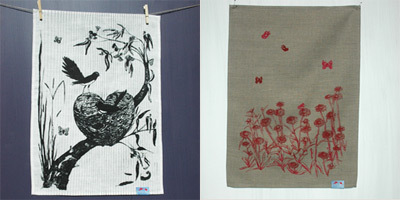 One subscriber will receive two linen tea towels from Laughing Bird in the Blue Mountains (RRP $25 each) and a chic raw cotton canvas tote from Ink & Stitch in Bondi (RRP $36). I have profiled Laughing Bird before here on Bondville, and the great Australian flora and fauna-inspired designs keep coming, including these Willy Wagtail and Everlasting Daisy designs. Ink & Stitch is a mother-daughter duo based in Bondi creating stylish tote bags featuring their own designs hand-drawn using water-based ink. These are just two of the many designers featured on Down That Little Lane - head over to check out the vast range of goods for home and family. Look out for the winners in the monthly newsletter, coming your way in the next few days. 3. This Lucky Door Prize giveaway is open to all Bondville subscribers in Australia only. 4. The prize consists (1) Laughing Bird tea towel (Willy Wagtail design) RRP $25.00, (1) Laughing Bird tea towel (Everlasting Daisy design) RRP $25.00, (1) Femme Tote RRP $36.00 plus postage within Australia from Down That Little Lane. 5. Lucky Door Prize winner will be notified in the Bondville Monthly newsletter, sent to subscribers the week commencing 6th September 2012.